Make every day special! 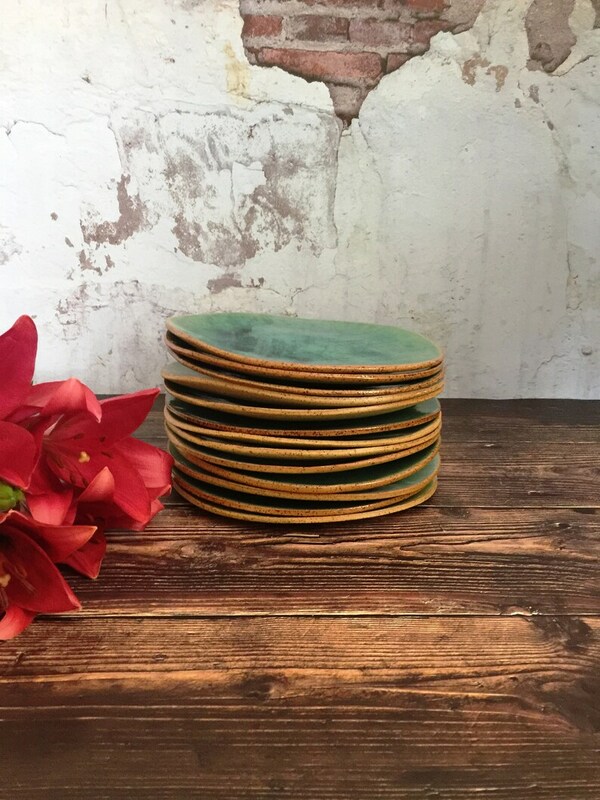 with this set of 4 handmade, rustic and unique ceramic plates. * Size: each plate is about 8.5" (21.5 cm) diameter. Hand built from scratch, using environmentally safe and natural materials from sustainable sources. Thanks to multi-step process including two high-temperature kiln firing, all products are durable and well-suited for any use. * Microwave, oven and dishwasher safe. * Kiln- fired at high temperature of 1200°C (stoneware). I find that handmade ceramics have special character with their slight variations, small “imperfections", and distinct marks from the handmade process, which make each piece unique. * It is not a perfect circle shape. * It is a flat plate (no high rim). * Due to the handmade process each ceramic piece is a little different but just as beautiful. MADE TO ORDER! It takes 3-8 weeks until it is ready to ship. Need it sooner? contact me so I can check what is the best I can do. Back to my VIBceramics Etsy shop - https://www.etsy.com/il-en/shop/VIBceramics. These coffee mugs are so beautiful! They also do an excellent job of keeping my coffee warm. Theshop owner provided excellent communication throughout the process. Bought as a gift. Recipient loved it, said the ceramics and the candle were beautiful. Everything was packaged will great care and the seller had awesome communication. Beautiful work. Fast shipping from Israel to California. Would definitely recommend this shop! You can pay with a credit card via PayPal without a PayPal account. "PayPal Guest Checkout" - Fill in your billing and credit card information. Enter your email address so PayPal can send you a receipt. Click Continue to return to Etsy. Your payment isn't sent until you click Submit order on Etsy. In case this is a problem for you, please contact me so we can find a way that suits both of us. State fees and taxes may apply in your country, and may change from time to time. Please review the implications before making a purchase from Israel. The price quoted does not include 17% VAT required by law (due to limitations of the system) After the purchase and your approval, a separate invoice will be sent for an additional 17%. Sorry for the inconvenience and thanks for your understanding. I'm not responsible for delays due to customs. All items are packed with extra care to ensure their safe arrival. I will replace or refund any item if it should break or is lost in transit. Please email me with information and a photo of the damage/broken item within 3 days of delivery. If, for any reason, you are not satisfied with your purchase, please contact me and I will do my best to solve the problem. In case I do not solve the problem, I will accept returns and exchange the item. All orders are wrapped as a gift! and of course, packed with extra care to ensure their safe arrival. For worldwide and/or combined shipping, I often use recycled boxes and packaging materials. * All "Ready to ship" items are shipped within 3-5 business days, from the day the order is placed and payed for. * "Made to order" items needs 3-6 weeks due to ceramics creation process. If you need it sooner please feel free to contact me so I can check what is the best I can do for you. * In both cases, I do my best to ship as soon as possible! On this issue that is not in my control, I wish to operate with honesty and integrity. I ship internationally from Israel and do my best to make it a good experience for you. I’m always looking for ways to reduce the shipping duration and cost. You’re guaranteed to receive free shipping upgrades when possible or a refund if I’m able to significantly reduce the actual shipping cost. This I promise you! Shipping duration and cost are based on information by the Israel international post service. - Shipping costs are calculated according to package weight, the quantity of packages and the shipping method. - Shipping duration is according to the shipping method. * Used only for low weight orders (up to about 7 oz (250 gr)). * Estimated delivery time for most destinations is 14-26 business days (depends on destination). * Tracking number with partial tracking information only. * Shipping upgrades for faster shipping are available in the cart. * Used for medium weight orders (up to 4.4 lbs. (2 KG)). the United States, Austria, Australia, Italy, Ireland, Belgium, Brazil, United Kingdom, Germany, Denmark, Netherlands, Hong Kong, Greece, Japan, Norway, Spain, Poland, Portugal. * Tracking number with detailed tracking information. * Estimated delivery time is 3-5 business days only to major destinations in the world. * It is the only shipping option for orders over 4.4 lbs. (2 KG). * These periods are stated on business days and do not include weekends & holidays in both Israel and the destination country. * These periods are based on information by the Israel post company. * Delays due to custom may occur. State fees and taxes may apply in your country and may change from time to time. It is the buyer's responsibility to pay the taxes that customs may require. Purchases within Israel - Please note that VAT is not included and must be added to the quoted price. See more info at Q&A "מידע בעברית". Attentive and reliable customer service based on a high service awareness and many years of experience working with customers. Please feel free to contact me through Etsy's conversation or by e-mail to my personal address at Vered [!at] VIBceramics.com. All items are packed with extra care to ensure their safe arrival, being fragile and shipped from Israel. When ordering more than one item, please let me know in a "message to seller" if you would like them packed in separate boxes, as I tend to combine them in one box otherwise. If you want your order delivered to someone else as a gift, please let me know. Also - I will gladly add a message from you in a card for the receiver at no extra cost. Please contact me about wholesale availability, to my personal mail vered@VIBceramics.com, with the item you are interest in and the annual quantity you plan for, and I will get back to you with a price offer. המחירים הנקובים אינם כוללים מע"מ (בשל מגבלות המערכת). יש להוסיף מע"מ על ביצוע רכישה בארץ (הפקת חשבונית נפרדת על התוספת). סליחה על אי הנוחות ותודה על ההבנה. The price quoted does not include 17% VAT required by law (due to limitations of the system) After the purchase and your approval, a separate invoice will be sent for an additional 17%. Sorry for the inconvenience and thanks for your understanding. מחירי השילוח הנקובים הם ל"חבילה מסניף לסניף", ומבוססים על מידע מדואר ישראל. קיימת אופציה לתאם איסוף עצמי מהסטודיו ברעננה. אשמח לספק מידע נוסף בעברית. ניתן ליצור עמי קשר טלפוני ל 052-6868665 או בכתב vered@VIBceramics.com. I knead & flatten clay using a rolling pin. I measure, cut & shape each piece by hand (slab technique). After drying the fragile clay pieces go into a 1st kiln-firing that makes them strong (Bisque). In my designs I use lead-free food-safe glazes, leaving the outside unglazed for a rustic style, that combines the natural clay Matt color with the shiny glaze. The 2nd kiln-firing is at a high temperature of 1200°C, for stoneware durable ceramic ware, that are microwave, oven & dishwasher safe. Opening the kiln is always exciting "How did it come out? Each item is unique with its own character & beauty. Like my mother used to say: "Patience pays!" Wedding Registry - Ceramic Dinnerware Set of the "Breaking Waves" Collection - Reserved for "Mr. & Mrs." - Example!